HomeCruisesCruising the Baltic Sea with Celebrity and Teenagers! Have you ever thought of a Baltic Cruise? Here’s my experience with Celebrity Cruises from last year. Our ship, aptly named Silhouette, casts a tall faint shadow on the dockside as we pull away from Stockholm. It is White Night season as darkness barely descends on the Baltic States for the months of June and July. 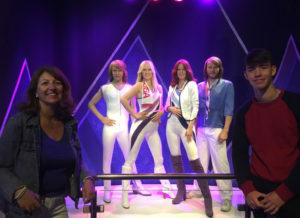 We’ve spent two days exploring the sights of Sweden’s capital city − divining inspiration at The Nobel Museum and flexing our vocal chords in The Abba Museum. 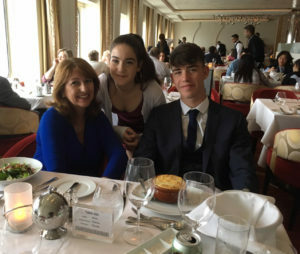 I’m joined by my sixteen-year-old son, Mark who is on his third cruise and daughter, Nicole, who is three years his junior and her fourth. They are fans of cruising but makes it quite clear that there had better be a good crew of teens on board. Our fellow passengers are a healthy mix of empty nesters, couples, grownup families and a small number of well behaved kiddies who seem used to travel. 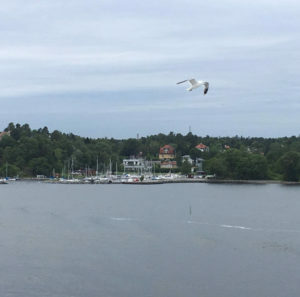 At dinner we glide through the picturesque Stockholm Archipelago, observing tiny islands filled with birds and pretty villages that hug the coast. Our waiter, Brian from the Philippines, fusses over me putting a linen napkin on my lap − sitting close by are Susan and Iris, two university lecturers from Florida. They’ve cruised before with Celebrity Cruises − Whale-watching in Alaska and explored the exotic wildlife of the Galapagos Islands. Meeting new people is one of the joys of cruising but a ship this size (with over 2,000 passengers) also offers plenty of spaces on the different decks to hideaway and be quiet. The kids leaves us to find new friends in the Teen Zone, while I return to our cabin at the aft of the ship. A balcony cabin enjoys a couch and dressing table with ample room to sit or lie outside with a glass of wine and enjoy the long White Nights. Our itinerary takes us to Helsinki for our first stop, so we breakfast at the Oceanview Café. Buffet-style is a delight for my ever-hungry-son who opts for a personalised omelette. The enormous American breakfasts, Indian and Chinese curries offer too much choice at such an early hour, so I settle for fresh fruit. Celebrity mash up their menus daily in the Oceanview creating dishes that reflect the ports of call. 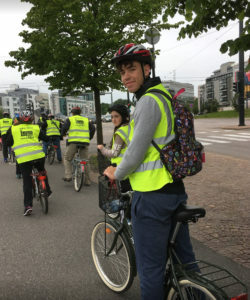 Our planed excursion is a guided tour of Helsinki by Jopo, a traditional bicycle without handbrakes or gears, popular in Finland. It takes a bit of getting used to but our group of twelve take a pace that doesn’t bore my son and is easy for me to keep up with. 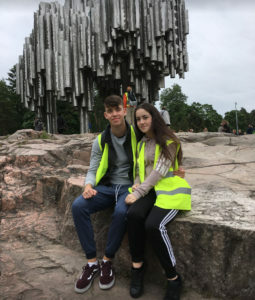 First stop is at the Sibelius Monument, sculptor by Eila Hiltunen, and erected in 1967 to commemorate the composer of The Finladia Suite. The beauty of cruising is that we enjoy an Amuse-bouche of each destination and can decide if we want to come back for a main course another time. 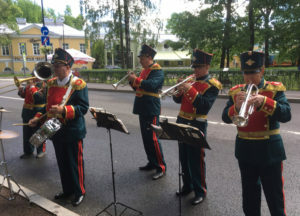 Helsinki is buzzing during the White Night season with numerous concerts and marquees, stag parties on boats and locals enjoying outdoor pursuits. It’s a chilly 16 degrees with a sharp wind but our guide makes the trip interesting and stops off at a store to buy some liquorice chocolate to give us a taste of his city…It’s disgusting so we discreetly bin it. Back on the ship Mark makes a new pal at the gym while I nurse my saddle-soreness in a hot tub on deck. After dinner Susan and Iris accompany nicole and I to the Abba-sing-along, where my son spots a group of tall girls from North Carolina, throwing themselves into Dancing Queen. The girls spot Mark, at 6ft4′ he’s difficult to miss, I know when it’s time to make my exit and sleep soundly in the knowledge that he can’t wander off some dark alley and get lost as he might on terraferma. Next day we wake on one of the fourteen sunny days enjoyed by St. Petersburg, per year. Booking our excursion on board saves a timely wait to get off the ship as security is premium and requires a visa − which is costly if not joining an excursion. The kids snooze while we travel the hour long drive by coach to Pushkin, to see the gold-domed-ice-blue Catherine Palace. Destroyed during the Second World War, it is now impeccably restored complete with a replica of the Amber Room. The walls are encrusted with amber, gold coloured resin, not to be confused with a gemstone but formed from fossilised trees over thousands of years. Our guide relays many anecdotes about Catherine the Great, notably her passion for young men − at sixty her lover was in his twenties − I watch as my kids squirms. 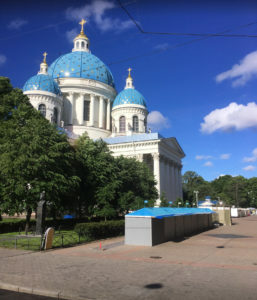 After Lunch we pack in a drive by The Hermitage and stop at The Sarcophagi of Peter the Great and the Tzars and Tzarinas of Russia at The Peter and Paul Cathedral. Mark maintains interest throughout but he’s itching to get back to the ship and the gym and the girls from Carolina. Nicole wants to take a dip in the whirlpool and so do I. 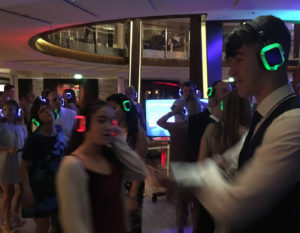 After a late night at The Silent Disco, (where music is streamed via personalised headsets while dancers bop around to the song of their choice) we opt for a lie in next day before exploring Tallinn, the capital of Estonia. It’s nice to take a break from a guided tour and the old town is only a short fifteen minute stroll away from our ship. 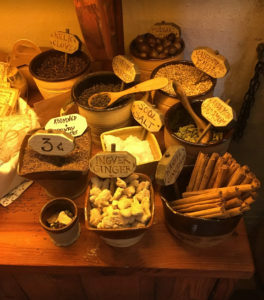 There we stumble upon Olde Hansa Restaurant and Shop, where medieval ladies tempt my son with aphrodisiacs and traditional fare. Those who stay on board the ship on port days can capitalise on special prices in the ship’s Spa. Lolling around at the poolside or taking a dip in one of hot tubs is a god way to spend time on board during port days, so hectic sightseeing isn’t necessary every day. 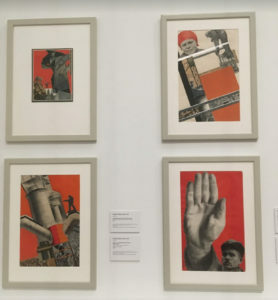 We take it easy in Riga with a short tour of the city’s Art Nouveau Architecture and pop into The National Art Gallery. Mark and Nicole indulges my culture fix but he’s happy to do so as Motown Night is order of the evening and he’ll be bopping with the girls from North Carolina later. 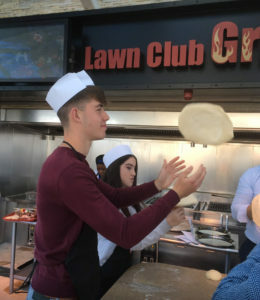 We eat at the Lawn Grill, a speciality restaurant − one of eight on board and my favourite Celebrity treat. Mark and Nicole take a lesson in baking flatbread which we eat for starters and no matter how hard I fight it I order a steak for the third night in a row. Our last day is at sea and the spa beckons before some wine tasting. Extras including speciality dining are charged to our room but it’s possible to keep tabs on the bill via the TV display in our cabin. We eat our way around the world in Qsine Restaurant, picking from the menu displayed on an iPad. Sushi Lollipops and Disco Shrimp dishes are delivered on wacky novelty sharing platters and playing with our food is encouraged − to think of all the wasted years I spent training my kids to eat properly. 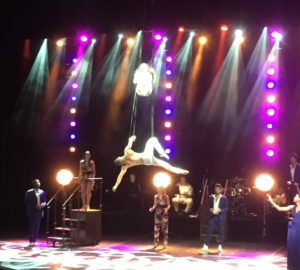 But Celebrity have broken the mould of dining at sea since Qsine was launched and it is now a very special kind of experience that other cruise lines are trying to copy. It’s our last night Nicole and Mark join me in the theatre. Entertainment runs concurrently around the ship each evening offering a variety of movies, comedy and of course the casino − for those who like a flutter. The ship’s band boasts accomplished musicians, such as trombonist Big Mike, who’s played with the best, including the legendary Stevie Wonder. As he ends the evening with Louis Armstrong’s Wonderful World, I look at my kids and feel utter privilege to have enjoyed such a variety of experiences with them. Although I’ll lose Mark to the girls from Carolina and the disco on Deck 14 in a bit, at least Nicole is by my side and for the moment it’s a Wonderful World. 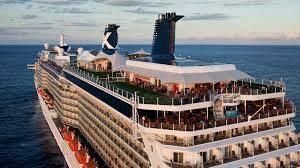 Join Celebrity Cruises’ (www.celebritycruises.ie, 1800 932 611) Celebrity Eclipse on a 12-night Scandinavia and Russia fly/cruise departing 18 August 2018. Price from €3,484 for the first guest staying in an Oceanview Stateroom, with the second guest paying half-price for their cruise at €1,930. Price includes return flights from Dublin, transfers, a 12-night cruise departing Amsterdam (Netherlands) and calling at Berlin (Rostock, Germany), Tallinn (Estonia), St Petersburg (Russia) for an overnight stay, Helsinki (Finland), Stockholm (Sweden) and Copenhagen (Denmark) before returning to Amsterdam for flights home; meals and entertainment on-board the ship and all relevant cruise taxes/fees. For more information or to book, call 1800 932 611, visit www.celebritycruises.ie or talk to your travel agent. 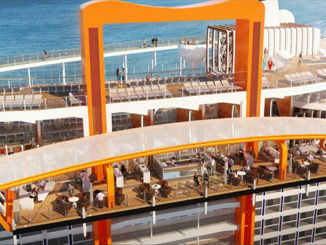 WOW Royal Caribbean take cruising into the future!